Thanks to more than 100 attendees at the forum on May 30 for your interest and participation. We especially want to thank the Mississippi River Network (MRN) for a small grant that made the event possible. 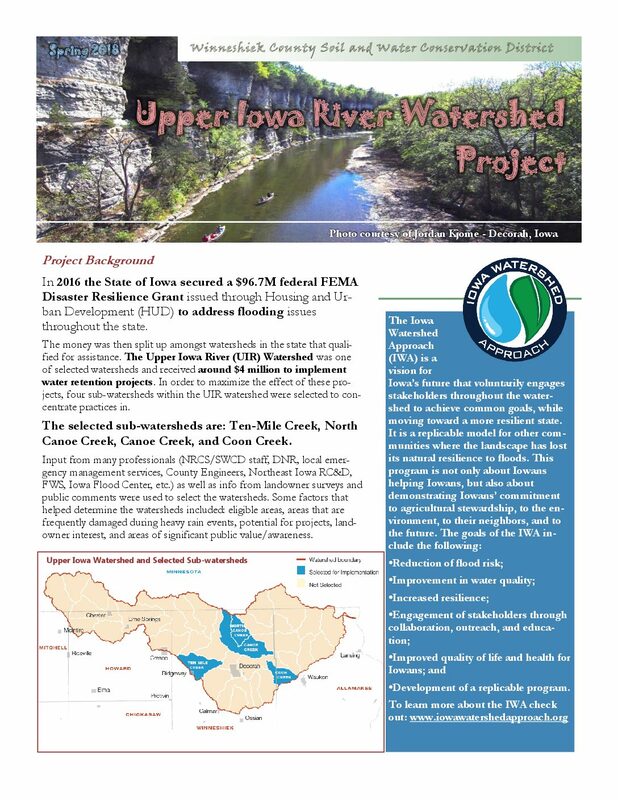 Additional support came from the Iowa Groundwater Association, Luther College Center for Sustainable Communities and Bob and Donna Bernard-Trout Unlimited Members. Other event co-sponsors were the Allamakee County Protectors – Education Campaign, Practical Farmers of Iowa and Trout Unlimited. We also greatly appreciate the diverse group of speakers from Iowa and Wisconsin who made the day a success. Ric Zarwell was born and raised in Allamakee County near the center of the precious and vulnerable Driftless Area. Ric has been an active member of Allamakee County Protectors, and is President of Allamakee County Protectors – Education Campaign. He conducts bird monitoring initiatives, primarily related to sustainable wind energy projects, as a senior ecologist with Stantec Consulting, Inc., and he coordinates North American marketing activities for Rockjumper Worldwide Birding Adventures, the largest such tour company in the world. Since retirement, Ric’s passion for birding and exploring the natural world has taken him and his wife Betty to 44 nations and all 7 continents. Ric holds degrees in Wildlife Biology and Natural Resources, both from the University of Wisconsin at Stevens Point. John Beard, Winneshiek County Supervisor discusses area trout fishing. John Beard, Winneshiek County Supervisor discusses karst water quality. John Beard is a Winneshiek County Supervisor. He has made a living by owning and operating J.W. Beard Welding & Machine and also a family cow/calf beef operation from which he is now retired. His agricultural pedigree is a solid line of farmers, starting with one of the first settlers of Winneshiek County. He is a lifelong hunter, angler and naturalist who helped found local Pheasants Forever and Trout Unlimited chapters. He served in the State Legislature from 2008-2010. Dr. Bob Libra is the State Geologist of Iowa and has worked with the Iowa DNR and Iowa Geological Survey for over 30 years. His work has involved a wide range of geologic and water-related research and service, with focus on groundwater. A native of Sandstone, Minnesota, he has degrees in geology from the University of Wisconsin-Superior and Indiana University. Dr. Eric Baack has been a member of the Luther College biology faculty for 10 years, where he teaches evolutionary biology and biological statistics. His research includes genome size evolution in plants, domestication and hybridization in sunflowers, and the evolution of drug resistant bacteria. Sheri Schwert just graduated from Luther College with majors in chemistry and environmental studies. She grew up on a dairy farm in Gays Mills, Wisconsin. Elijah Kane will be entering his senior year at Luther College with majors in biology and data science. Max Eness is entering his sophomore year at Luther College with majors in environmental studies and philosophy. 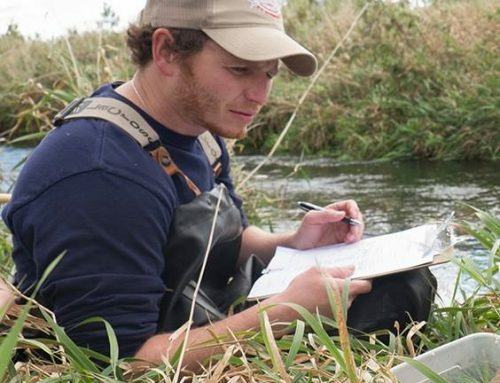 Michael Steuck is currently the Northeast Regional Fisheries Supervisor where he oversees management of the cold and warmwater fisheries resources in 15 counties including two fisheries management teams and three trout hatcheries. Mike received a Bachelor’s of Science degree in Fisheries and Wildlife Biology with a minor in Botany from Iowa State University, and has over 25 years of river resource management and research experience with the Iowa DNR Fisheries Bureau. He is a native of Dubuque and an avid angler. Dr. Mark Borchardt is a Research Microbiologist for the USDA – Agricultural Research Service. He is also Program Leader for the Laboratory for Infectious Disease and the Environment, US Geological Survey, Wisconsin Water Science Center. Dr. Borchardt’s expertise is on the measurement, fate, transport and health effects of human and agricultural zoonotic pathogens in the environment. Recently, he received the Dr. John L. Leal award from the American Water Works Association for his work on improving water quality and protecting public health in the United States. Davina Bonness is currently the County Conservationist for the Kewaunee County Land & Water Conservation Department. She received her Masters of Science in Environmental Science and Policy from the University of Wisconsin-Green Bay and has been actively researching water quality, karst topography and land-use in Kewaunee County for the past 10 years. David Vetrano worked for the Wisconsin Dept. of Natural Resources as a Fisheries Biologist for more than 33 years. During his tenure he saw the fishery in his area change from heavily stocked “put and take” to almost totally self-sustaining. He now consults for Trout Unlimited and serves on the Board of Directors for GrassWorks and the Dairy Grazing Apprenticeship Program. He and his wife Linda farm east of La Crosse where David grazes Jersey steers and Linda, a classically trained culinary chef, has a specialty dessert business. Dr. Gene Tinker is Animal Feeding Operations Coordinator and Agricultural Liaison for the Environmental Services Division of the Iowa Department of Natural Resources. He works with agricultural groups, environmental organizations and others to develop and implement rules to protect the state’s natural resources while maintaining economic viability for production agriculture. Gene works with the permit review engineers and geologists as well as environmental specialists in the 6 DNR field offices to assist livestock producers with meeting all state requirements. Prior to joining the DNR, he worked for University of Minnesota Extension and Iowa State University. He has degrees in Animal Science, Agricultural Education, and Animal Breeding and Genetics from Iowa State University and Oklahoma State University. Chad Ingels raises corn, soybeans and hogs on the family farm near Fayette and operates ClearWater Ag Strategies, LLC where he assists farmers in developing and implementing manure management plans. He formerly worked with northeast Iowa farmers as an Iowa State University Extension and Outreach watershed specialist for 16 years, providing facilitation and administration services for five farmer-led watershed councils. He is currently serving his second term on the Iowa Environmental Protection Commission. Tom Frantzen and his wife Irene Frantzen own and operate a 320 acre certified organic grain and livestock farm in Chickasaw County. They have 55 beef cows and 40 brood sows and they feed out all of the stock to slaughter. They are proud members of Organic Valley Coop and most all of the farms output is marketed through that coop. The farm became 100 percent organic in 2000. The Frantzens were named as Farmer of the Year by the Midwest Organic and Sustainable Education Services organization in 2009 and recognized with the Leopold Center for Sustainable Agriculture Spencer Award in 2016. Ann Y. Robinson is Agriculture Policy Specialist at the Iowa Environmental Council. She has worked in project management, policy and communications for NGOs, Extension and state government. Ann has degrees from the University of Missouri-Columbia and University of Wisconsin-Madison. She was raised on a diversified century farm in Missouri, and once owned and helped operate a small farm near Decorah. “Contamination in Karst” webpage with link to karst map, fact sheets and information on the Iowa Grants to Counties Water Well Testing program.” Accessed June 12, 2017. Environmental Services Division, Iowa Department of Natural Resources. Driftless Area Restoration Effort (DARE). Celebrating the Economic Impact of a Priceless Jewel: Economic Impact of Truot Angling in the Driftless Area. 2017. Find related information and documents. “Forum explores relationship between karst, livestock operations and water quality: Ag officials share troubling examples from Wisconsin,” by Orlan Love, Cedar Rapids Gazette, June 6, 2017. “Groundwater Quality Changes in a Karst Aquifer of Northeastern Wisconsin, USA: Reduction of Brown Water Incidence and Bacterial Contamination Resulting from Implementation of Regional Task Force Recommendations.” By Kevin Erb, Eric Ronk, Vikram Koundinya and John Luczaj. In Resources 2015 (4):655-672. “Iowa’s hog confinement loopholes are causing a huge stink.” By Donnelle Eller.Des Moines Register. June 12, 2016. “Karst can aid rivers as well as streams,” by Orlan Love, Cedar Rapids Gazette, June 2, 2017. “Take Heed, It’s Your Water AND Your Health” by Tim Wagner, Decorah, Iowa Environmental Voice blog article, March 9, 2017, on karst and groundwater quality in Northeast Iowa, for Groundwater Awareness Week. For questions about the forum, contact event coordinator Ann Y. Robinson, Iowa Environmental Council, at Robinson@iaenvironment.org or 515-244-1194, ext. 211.